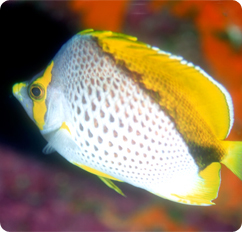 A butterflyfish that does very well in the home aquarium. It comes from deep water and is very expensive. They eat all kinds of food and probably won’t go after corals but it’s still a risk placing one in a reef tank. They do well in FO or FOWLR tanks. Butterflyfish do need space and peaceful tank mates, so they should be kept in large tanks.